R.E.M. was the first music we heard coming from the field, but we were still on the concourse. We’d just come up the escalator through the Jackie Robinson Rotunda and we were ready to work our way around Citi Field. While I enjoy college baseball games, we weren’t there to see St. John’s and Georgetown. Most of the 20,000 or so who actually made it out to the ballpark were there for the unveiling, the soft open of Citi Field — and its food. We were barely halfway down the first-base line on the concourse when I noticed Blue Smoke out behind center field. Our trajectory was set. They started announcing the lineups and John Franco took the mound to throw out the ceremonial first pitch, but we stood on line at Shake Shack and Blue Smoke and Box Frites. I took off my hat as the national anthem played, but I wasn’t anxious to place my order and get my food to get back to my seat (and that felt weird at first). Instead, the smell of the grill — of the Shackburgers — weighed more on me, and that’s what I found myself anticipating more. “If I see Danny Meyer, I might just kiss him,” I said as we downed our burgers, pork sandwiches, fries and beer on a wall at the top of a stairway out beyond the center-field scoreboard. Shea Stadium had its charm, its character, its history. But it also had its rust, its gunk, its grunge, its smells and its attempt at food. Citi Field tops it all. We spent the afternoon at the ballpark and never even found where our seats, as printed on the tickets, were located. We circled the ballpark on the field-level concourse — a first in Queens — and did the same on the promenade (upper deck) level. We ducked into several shops, read multiple menu boards and made our way back to Danny Meyerland for a second lunch of tacos. In 23 years of attending games at Shea, I saw games from just about every vantage point — field level behind the dugout, boxes on the loge, mezzanine and upper levels, the top row, the picnic area, the small slivers of seats in fair territory down the lines. After one look at Citi Field, I hope to take in as many different views in must less time. I appreciate baseball’s history as much as anyone. I lament the fact that I never got to Chicago in time to see Comiskey Park and I would probably use a chance at a time machine to see games at the Polo Grounds, Ebbets Field, pre-renovated Yankee Stadium (the true original Stadium) and several other old parks. At times, I’m sure I’ll miss Shea, where I saw scores of games and I’ll miss Yankee Stadium, where I saw my first game. 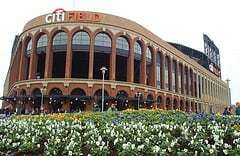 But those days should be few and far between now that the Mets have a beautiful new ballpark that they both deserve and need. Citi Field wasn’t quite complete for this soft opening — it was just short of a full dress rehearsal, with the Mets still in Florida, after all — but it was only a few Jackie Robinson murals and outfield advertisments short of being finished. It didn’t feel like Opening Day, but it sure felt like a new era.